Marco Polo was a Venetian merchant and traveller who lived some 800 years ago so it’s really about time he had an online slot machine dedicated to his various adventures. Well now we have one in the shape of Golden Caravan, a game developed by Play N Go with some colourful graphics and a free spins bonus round. 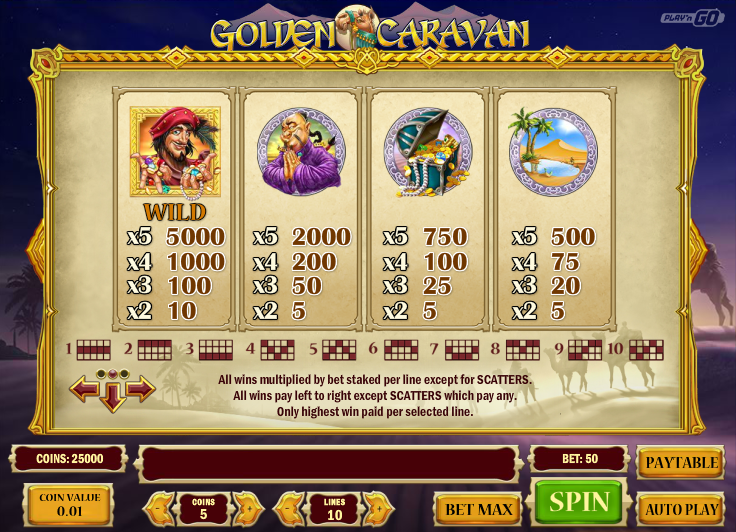 Golden Caravan is a a five reel slot with three rows and up to ten paylines; those reels spin within an ornate golden frame while in the background we can make out a desert scene with camels and palm trees under a starlit sky. There are three theme-related symbols including the purple-garbed trader, the treasure chest and the oasis; 10, J, Q, K and A represent the lower values. The caravan master is the wild symbol and he will substitute for all others except the camel; the camel is the scatter which activates the main feature. This is triggered by landing three of the camel scatter symbols anywhere on reels one, three and five for which you will now receive ten free spins. During this round landing three more camels will reset the number of spins to ten again and increase the win multiplier by 1x. 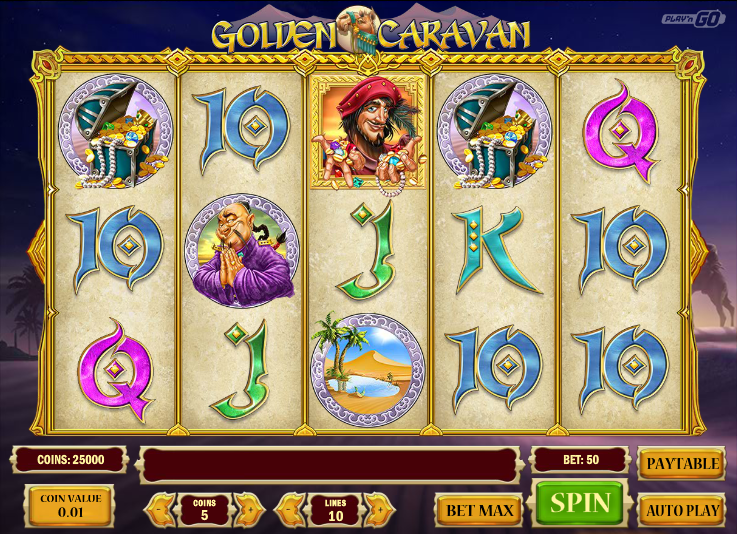 Golden Caravan has a nice theme, although Marco Polo himself doesn’t seem to appear; the free spins round has a clever enhancement and you always have the option to gamble any winnings.